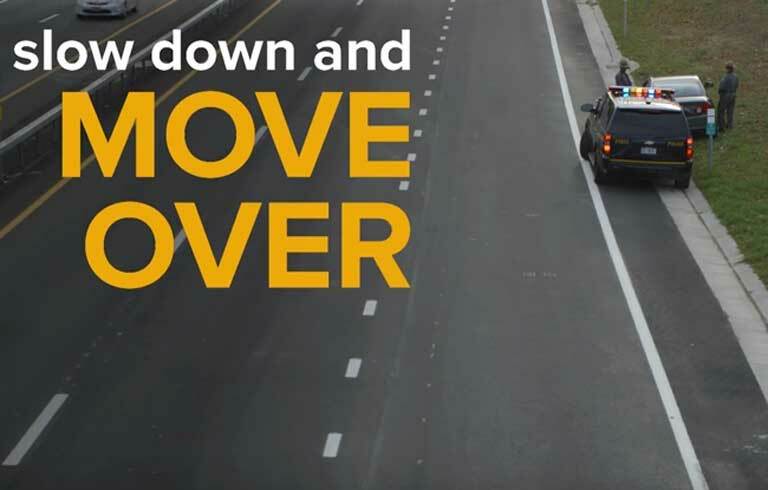 The Move Over Law means you must act when you see any emergency or hazard vehicle displaying flashing lights and is parked, stopped or standing on or beside the roadway. This includes roadway construction vehicles and sanitation vehicles. If you drive on parkways or controlled access highways, you must over one lane from the stopped vehicle, if it is safe to do so. Otherwise, and on other highways, you must slow down and drive with caution. Every year, police officers, maintenance workers and tow truck personnel are killed because drivers fail to adjust their speed and give stopped vehicles enough room. The law exists to provide a safe environment for police, ambulance crews, and other people working along our streets and highways. When they stop close to traffic, most accidents are prevented if drivers leave more room for them to operate. 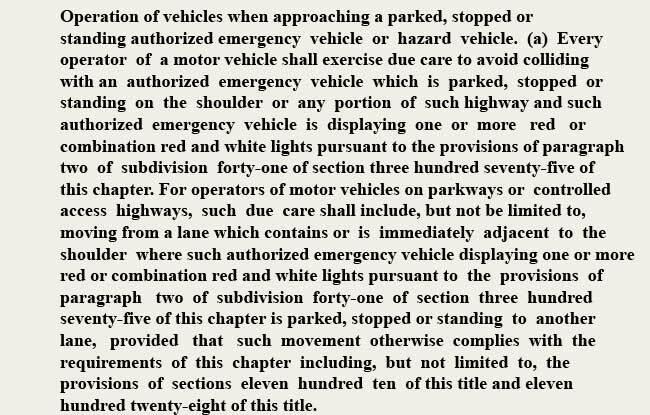 By law, you must exercise due care to avoid colliding with an authorized emergency vehicle which is parked, stopped or standing on the shoulder or any portion of such highway and displaying any combination of flashing blue, red and white lights. The law also includes hazard vehicles, like tow trucks and maintenance vehicles, stopped along the road and displaying one or more amber lights. Since 2017, vehicles displaying a blue or green light are also covered by the New York Move Over Law. 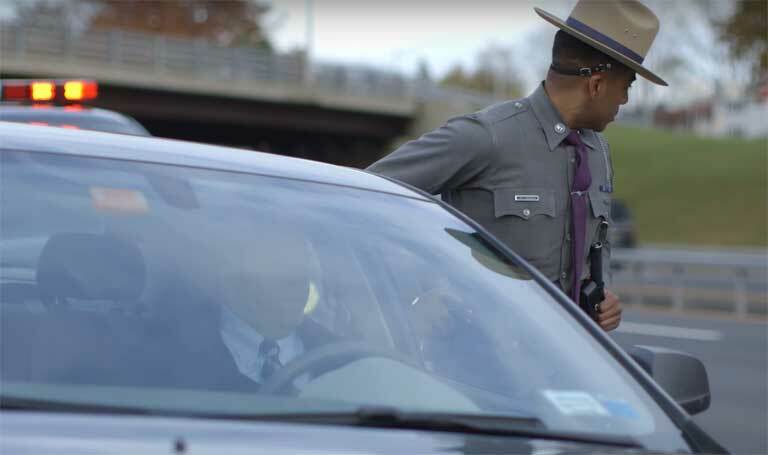 It is important for you to remember that the New York Move Over Law basically means you must slow down and give room to all authorized vehicles when they are performing any kind of duty on or beside the road and displaying flashing lights. It doesn’t matter if the vehicle is stopped on the road, on the left or right shoulder. You must always make everything you can to avoid an accident. Exercise due care means you must take reasonable actions with regards to existing circumstances. You must look out for the safety of yourself and others. 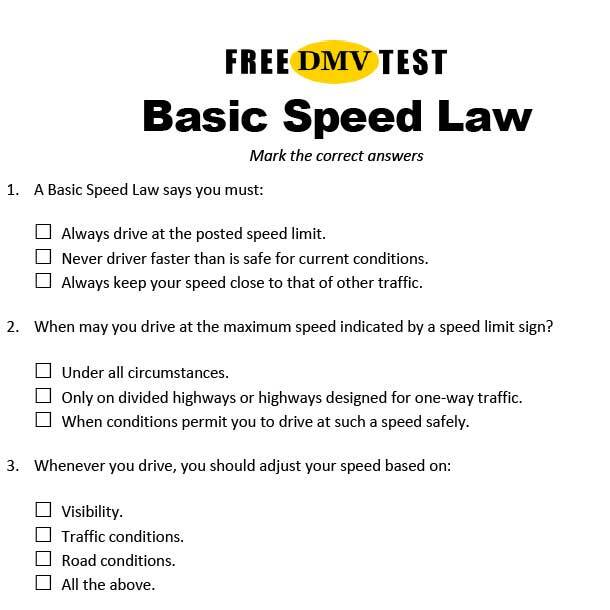 Your first action is to make sure your speed is reasonable and prudent. Take your foot off the gas pedal. Be alert and make sure you can stop if someone suddenly steps out into your lane. The closer you drive to a stopped vehicle, the slower you must drive. On parkways or controlled access highways (multi-lane highways), you must move from the lane immediately adjacent to the stopped vehicle. 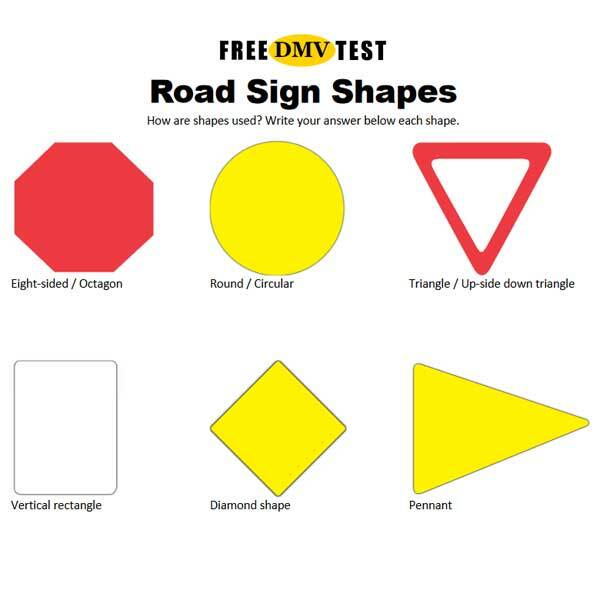 Check your mirrors and glance over your shoulder to make sure your blind spot is clear. Then, move over to the next lane if it is safe to do so. Try to move over well ahead of the stopped vehicle. When you drive on a two-lane two-way roadway, you can pass and move over to the left side of the roadway – if it is safe and not prohibited by signs or pavement markings. If there is a solid yellow line on your side of the roadway, you must stay in your lane and slow down. The Move Over Law doesn’t allow you to disobey other traffic control devices, such as pavement markings. If there is oncoming traffic and dangers on both sides of the road, try to “split the difference.” Slow down and steer a middle course between the oncoming cars and the stopped vehicle. If the road is blocked by the emergency vehicle, be prepared to stop and wait for instructions. Don’t move into the opposing lane, unless directed to do so. Keep a safe distance to the stopped vehicle. Don’t drive onto the shoulder and park your vehicle.